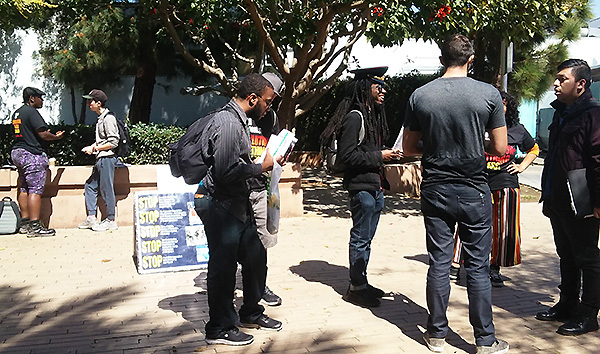 The National Revolution Tour has been out everywhere in Los Angeles, from South Central to Hollywood, from the high schools to the community colleges and the universities, from East LA to Santa Monica. We have been working very hard, but it has been exhilarating going out everywhere to people with revolution straight-up and full out. 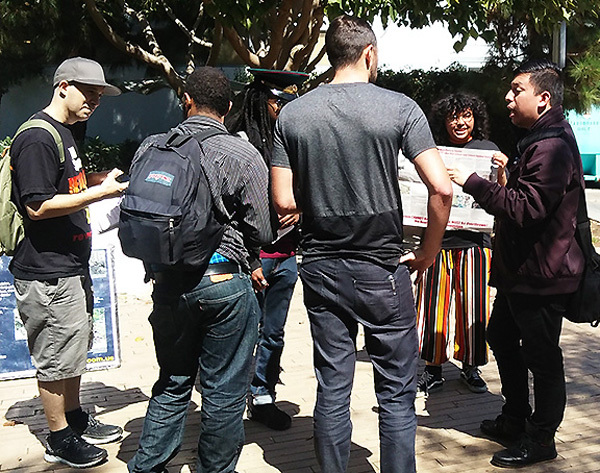 At a prominent community college on the west side of LA, where a lot of students from different backgrounds and from different parts of the city go to school, the Tour decided this was a strategic section and place to go to organize forces for revolution. We had a short political and ideological orientation to ground ourselves in what we were doing there and the urgency of acting now during a “jolt” in society—of the consolidating of fascism—to organize forces for revolution, as there was still a need more than ever when a fascist regime is more dangerous than ever to be in the streets on March 29 as called by refusefascism.org. We made a plan of going straight into the middle of the quad and to set up displays of the 5 Stops and did agitation about people being played by the Mueller report, where Trump's white supremacy came from, and the two choices we had: either live with all this and condemn future generations to the same or worse, OR make revolution to overthrow this system. The “5 Stops” poster and agitation drew some pro-Trump forces who wanted to debate. The more we got into the actual facts and science of the way things are, the more other broad-minded students came forward. There was contention over whether the oppression of Black people is now a form of genocide, as a Black student was arguing that it wasn’t. Other students walking by listening were called in to respond to this question and brought into the debate. A woman of color was agitated by a pro-Trump student and felt compelled to ask him some questions and challenge his thinking. She argued with us about his whiteness, but she was attracted to the revolution being there and got organized. A Pan-Africanist spoke to the 5 Stops and talked about his background of reading Marx and Lenin. He had heard about BA from “Maoists” who didn't like BA. We struggled over his role, like we did with a lot of the students there, about what they were going to do, because we can't be talking about the same thing and protesting the same outrages 50 years from now. The next day, the Tour returned with a literature and organizing table. Again, the “5 Stops” displays drew people in. A lot of students pointed to the one about the environment or the genocidal persecution of Black and Latino people. They were agonizing over what to do to stop all this. Many could see there was no solution under this system, including a young man who said the police are out to serve and protect a system that was founded on slavery and genocide. While we joined things deeply, nobody—for now—was willing to take that step forward into the revolution. What stands out, though, was our consistency to get into problem and solution, and directing them to the leadership we have in Bob Avakian and getting some into what the new communism is and what it means for humanity and the planet.